The stones and the village at Avebury. 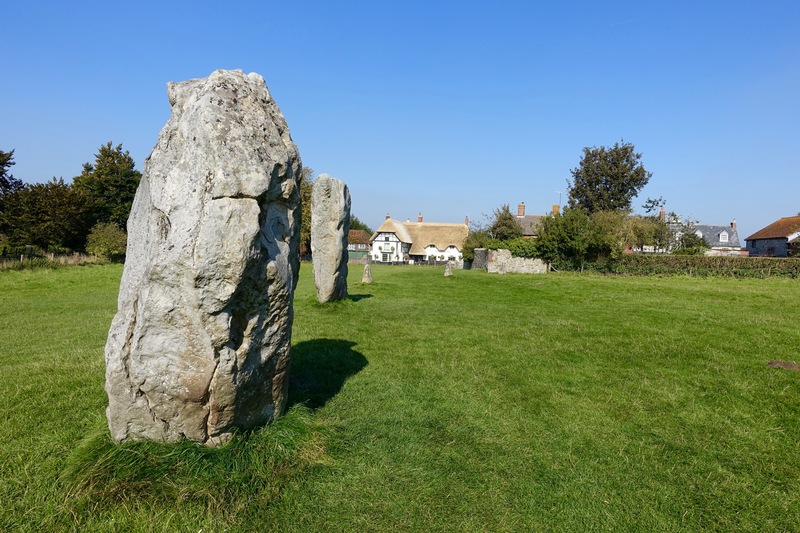 People have been around these parts for a very long time, and we saw evidence of that last week with a visit to Avebury, a village in the center of a ring of stones placed by someone 4,000 to 5,000 years ago. Walking on the bank outside the ditch outside the circle of stones. Avebury brags of having the remains of the largest prehistoric stone circle in the world. Many of the stones are missing, buried in the 14th Century, maybe by more of those religious whackos trying to erase something they did not agree with. You see a lot of that in England’s past. The stones were further pillaged in the 18th Century to use in the village buildings. The largest stone circle goes around other smaller ones. The whole site is surrounded by a bank of earth and inside that is a wide ditch. The outer bank is broken at four points, one of which opens onto two rows of stones (many missing) that formed a processional. Avebury is 24 miles north of Stonehenge, which we visited on our trip in 1982. Far fewer people at this site and more freedom to move around. We walked the whole circuit, partly from stone to stone but then on the high bank surrounding the site. 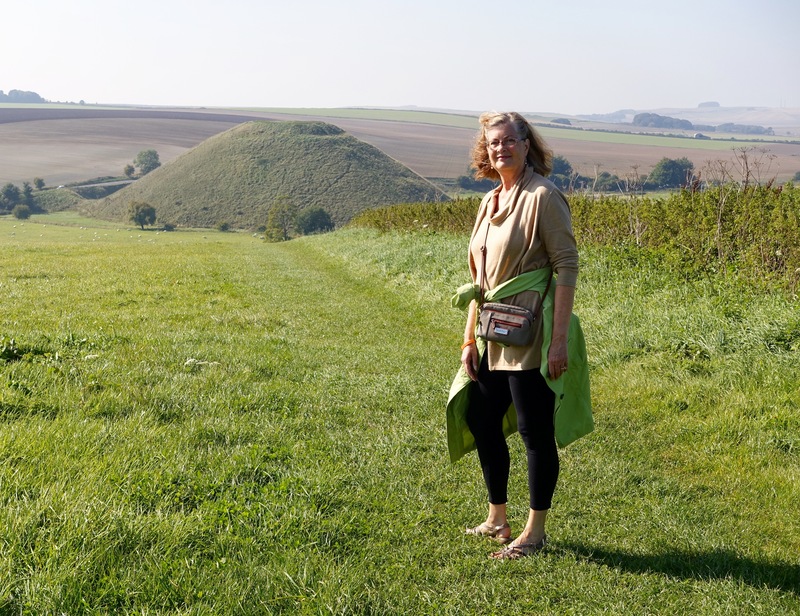 Kathy with Silbury Hill in the background. We also followed the processional and took a right turn at the end of it on the trail over to Silbury Hill. It’s a 130-foot tall man-made mound. It dates from about 2,400 BC and its purpose is unknown. Fodor’s guide says it is “comparable in height and volume to the roughly contemporary pyramids in Egypt.” Also says Silbury Hill is the largest man-made mound in Europe. Besides providing useful site information, Fodor’s guide was also helpful in finding an excellent lunch spot. We could have gone to The Red Lion, which advertises itself as the only pub in England inside a prehistoric stone circle. But we followed the advice of Fodor’s and drove to the Waggon and Horses pub. Built in a former stables, the pub still has drawers above the bar that were once used to store horse medicine. Several flights of ale were ordered (except by our designated driver) with the Dirty Rugger draft getting heavy play. Classic pub surroundings and good food, too. The pub had a sign outside that we have seen at several eating establishments: “Reserve now for Christmas.” We asked about it and had a good discussion with our server about holiday customs. She told us that most families eat their Christmas meal out and that waiting too long to reserve a spot may mean you end up eating oatmeal and offal at a fast food joint — something no holiday celebrant should be subjected to. 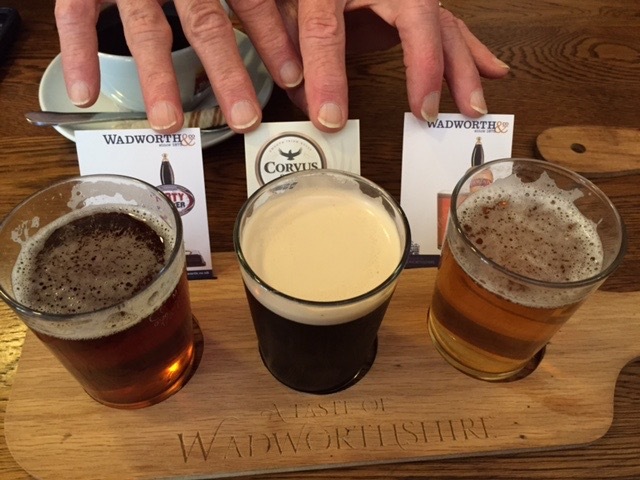 A flight of ale at the Waggon and Horses pub. Dirty Rugger is on the left with an oatmeal stout in the center. 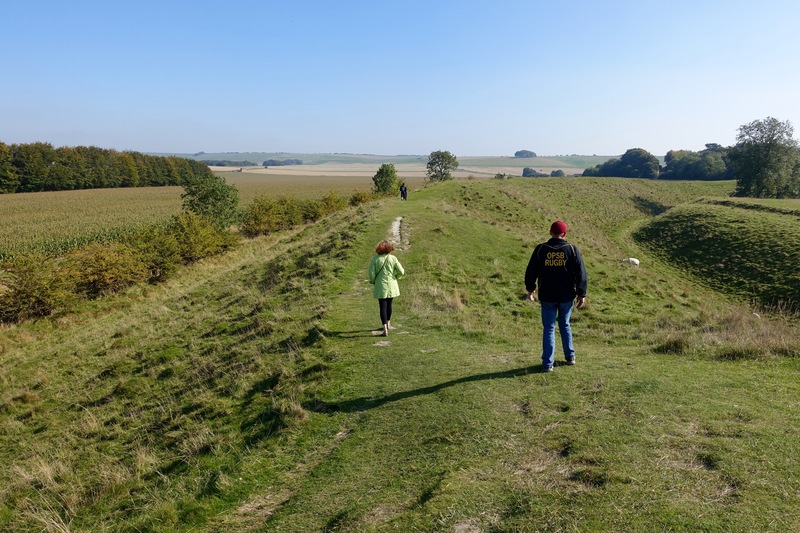 Posted on October 9, 2015 October 9, 2015 by jbsaulPosted in TravelTagged Avebury, Corvus, Dirty Rugger, Fodor's, Silbury Hill, Wadworth, Waggon and Horses.